Now more than ever a blog is essential for any business. I have written previously about how your customers are using the internet for all manner of tasks. You can learn just about anything online now, book everything online, order all manner of services, you can even design custom fabric and get a pattern printed directly onto it and sent to you to sew. You can probably hire someone to sew it for you too! How do customers and clients find the products, services or contractors that they want? They use search and they use social referrals or finds. Think about your last five online purchases: what prompted you to purchase? Traditional media still plays a part so we must consider how journalists find our businesses. If you consider word of mouth to be your main channel, how does one person recommend your service to another? “Here, I’ll send you a link on WhatsApp”. Underlying all of these is the strategic use of your own space online, your own online hub. A website optimised for search, full of fresh content that responds to your customers’ goals, questions and needs. Posting regularly on a blog can help you achieve this. If you are running your own business, chances are that you are responsible for many roles within that business. Even if you have the good fortune to have a contractor to help with online, ultimately you have to manage it strategically. Blogging is a good speed for a business. Caitríóna Redmond has written about how slow blogging has changed her life. She has some great tips which basically boil down to “Stop beating yourself up!” Take the time to create a post, research it, find arresting visuals and your content will ultimately be stronger. I love her idea that you should consider going back over old posts and sprucing them up. I know I have a few posts that would be excellent for our Instagram account if I updated the imagery. Similarly, I’ve been mulling on this post for about 2 weeks while I work on other stuff, jotting down the reasons to blog more as I think of them. Anyone who reads this blog regularly knows that I love statistics. Here are a couple of my favourites that help make the case for blogging with plenty more if you follow the links and feeling so inclined! B2B companies that blog report 67% more leads than those that don’t, according to HubSpot, State of the Inbound Marketing Lead Generation report 2010. In the 2017 the 4th annual blogger survey from Orbit Media 85% of business bloggers report that their blogging delivers strong results or some results, including a 20% increase in the number reporting strong results. While you might find your live spot on TV or radio wandering into irrelevance, due to the presenter’s lack of preparedness, you can keep your blogposts on point. Or you may be misquoted or misrepresented in the press, while your own blog allows you to share about all the moving parts that make up your business. You can write about the decision making process that led your product or service to this point. You can create depth and connectivity between the start and where you are now. You can write blog posts that respond to your customers’ goals, that show them how your product is used, that reports on how your services alleviates problems. 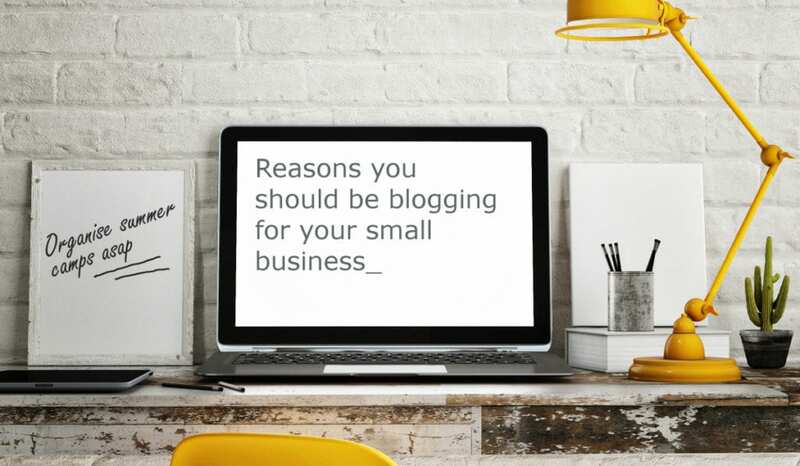 All of these types of blog posts help potential new customers in their consideration of your company. I always tell clients that people love process. They love to watch videos, even rough and ready Instagram stories, that explain where you are at with your work. They like to understand how you made something. As a smaller business, you are likely very hands on in the process so revel in that. The great thing about blogging is that it’s okay to be niche, the nicher the better ;-) because that’s where the long tail, high value, business resides. Write a post about conferences you attend and nerd out entirely on your area of expertise: it’s all grist to the mill. Write a post about equipment that your customers might find useful in conjunction with your product or service. Write a post about why you developed a product. Show your customers your passion for your work and it will be infectious. If your strategy includes social media, you will need something more than hilarious GIFs and pictures of cute kittehs to populate your Twitter, Facebook, LinkedIn or Pinterest profiles. Your blog content is perfect for social. Because of the algorithmic nature of social it’s okay to share aspects of your blog post as different updates in the period following publishing. Choose key passages that appeal to different audiences on different media. Use different formats and imagery to share the same message on different platforms. Consider how you can share the message on the live platforms available (Facebook Stories, Instagram Stories, Twitter Periscope). Watch how the updates land: is it worth boosting the post across media? Sharing this passion and sharing your story are key to earning your customer’s trust. I’ve listened to a number of podcasts recently that address the issue of fake news or “junk news” as one interviewee calls it. The reason that Facebook and Twitter are at the heart of this issue is, according to Philip Howard, the Oxford professor who uses the term junk news, is because of the very fact that we trust the people that we follow there. We trust our friends and family. We trust that when they share information that they have read beyond the headline, that they have done their due diligence. This is becoming increasingly difficult as even the most seasoned activists can be hoodwinked as one testimonial in this podcast reveals. Therefore if a potential customer finds your site via search or a social recommendation or a link from an article and their experience on your site is optimal then it will be easy to gain their trust. If that experience includes content that shares your passion for your product or service, that shows your company’s integrity, that is useful, entertaining or informative, that assists them in their current online quest then you will be on the way to gaining their trust. On May 25th the General Data Protection Regulation will become law. If nothing else it will raise awareness about data privacy and the value of our own data, of our privacy. As EU citizens roam about the web, their understanding of that value will be a factor in their decision making. If you ask them to share data with you during a transaction of any kind, they need to decide whether it is worth the value of their data as well as any actual monetary price they may have to pay. The trust you are building with the authentic content that you have created and shared on your blog, will help them make that decision. If they know there is a real person behind the screen, they know they can reach out and assert their data rights if they need to. If their experience on your site is optimal, they will believe that you will be able to manage that duty, responsibility and obligation carefully. They will trust that you have done your due diligence with your third party data processors. Ultimately it’s about creating a sense of authenticity. Many of my clients work directly with their customers, through classes, events, gigs, or one-to-one consultations. In many cases they have chosen to start their own business in order to share their passion. They do this when they are face to face with their clients and customers. Without a strong sense of authenticity, their face to face experiences would fail. This passion can be communicated on your business blog. This blog will also succeed if the posts are written from that authentic place. Yes, it is true, that even the most authentic person sometimes needs help with their writing but a good copywriter or content specialist (ahem!) will capture your authenticity and your passion and transfer it to your blog. As regards Search Engine Optimisation (SEO) it is worth bearing in mind that the Google algorithm and those of other search platforms continually strive to replicate human search behaviour. If someone searches for keywords associated with your business the many parameters for that algorithm tell its bots, its spiders, to find and display results based on criteria coded to be humanlike. These criteria have been added to and finessed over the years to try and display a Search Engine Results Page (SERP) that matches the likely results that you were expecting. If you search for “Jazz Dublin” the algorithm is smart enough to know that you probably want to know about upcoming jazz gigs in Dublin. In fact it is smart enough to know that even without the word “Dublin” if you are in Dublin already. In fact, depending on your relationship with Google it is likely to display information about jazz gigs in Dublin if you use the search term “what’s on this weekend” and you have shown a preference for jazz previously. What this means for your business blog is that if you keep it current and topical using keywords naturally for your niche you should see a pick-up in results over time. The more authentic you are, the easier it will be to weather the storm of new releases of the algorithm as it steps closer to understanding the relation between what you are communicating and what your potential customer is seeking. The recent ups and downs with our favourite social media platforms confirm that I was right to call my company OnlineHub.ie. I believe that every company should have their own online hub, their own piece of (virtual) real estate, a place online to call their own. They can decide the pace and develop their understanding of the impact of that resource on their business. With your own online hub you are less prey to the vagaries of algorithms and regulations. You can choose how to display your wares. It’s like the difference between being in your shop or at a trade show. Yes the trade show will expose you to potential new customers but those who visit your own shop are further along the path to purchasing and are more motivated to be persuaded in that direction. Finally a blog can be a great company resource. Most of my content comes from questions raised by my clients or at seminars, or networking meetings. I can’t rest until I have answered the question. A great example is a recent post on Facebook Business Manager. I had been telling clients individually how to set up Business Manager but now I just point them at this resource. Similarly Fiona Hedigan, MD of Flora+Fiona, received numerous queries on the best way to use her products so she developed this blog post. All of these resources can be evergreen content, rich with keywords, that will continue to attract traffic long after you have moved on to the next question. Change is inevitable and you can use those changes that affect your product or service as an excuse to update your content and keep it fresh. As mentioned above they can used to keep your social media feeds stocked. Similarly, blog content makes great newsletter content so don’t be afraid to ping those inboxes with your freshly crafted content. I’d love to hear what motivates you to blog for your business. So many business owners need that extra real-life anecdote to understand so please share your thoughts in the comments below. Thanks for reading!